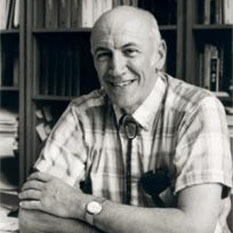 Larry Haskin was a Professor and Chairman in the Department of Earth and Planetary Sciences at the Washington University in St. Louis. He passed away in 2005 after a long struggle with myelofibrosis. Larry had many research interests over the course of his career, focusing on the Moon and lunar meteorites. He received his B.A. degree in chemistry from Baker University in 1955 and his Ph.D. degree in physical chemistry from the University of Kansas in 1960. A crater on the Moon was named in his honor.